Pumpkin Cake with Cream - Did you ever try pumpkin cake? If not, it is time! 1 Knead 200 g (approximately 1.5 cups) flour, 125 g (approximately 8 tbsp) butter, 1 egg, salt and 20 g (approximately 2 tbsp) sugar. Refrigerate for 30 minutes. 2 Cut pumpkin flesh into cubes and place in a pot with 100 ml (approximately .5 cup) of water. Simmer until soft, about 20 minutes. Rinse half a lemon, pat dry, finely grate zest and squeeze juice. 3 Drain pumpkin, reserving water. Puree with an immersion blender and add water as needed to make smooth. Mix puree with remaining sugar, cornstarch, 100 ml (approximately .5 cup) cream, sour cream, cayenne pepper, lemon juice and zest. Mix in eggs gradually. Beat remaining cream and set aside. 4 Grease a pie dish with remaining butter and sprinkle with remaining flour. Roll out dough to fit into pie dish and press into bottom and up sides. 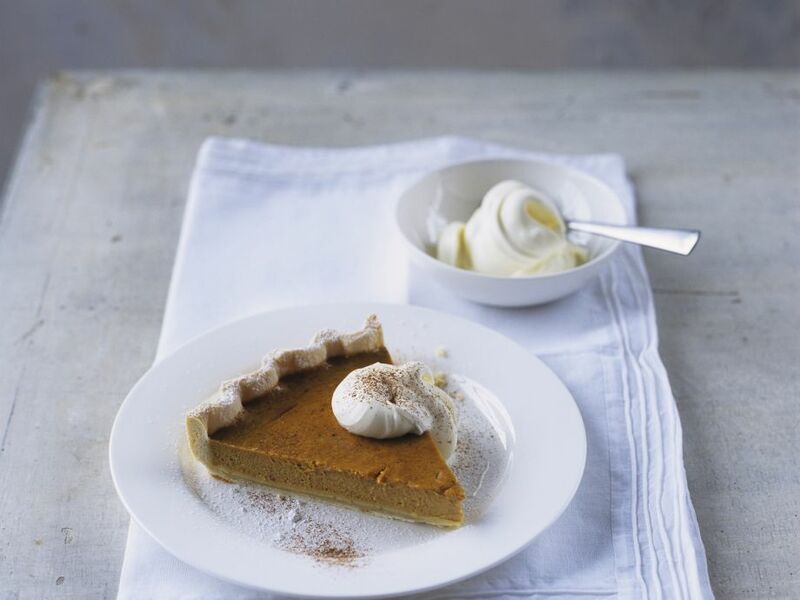 Pour in pumpkin mixture and bake in a preheated oven at 200°C (approximately 400°F) for 45 minutes. 5 Cool cake. Serve with whipped cream.